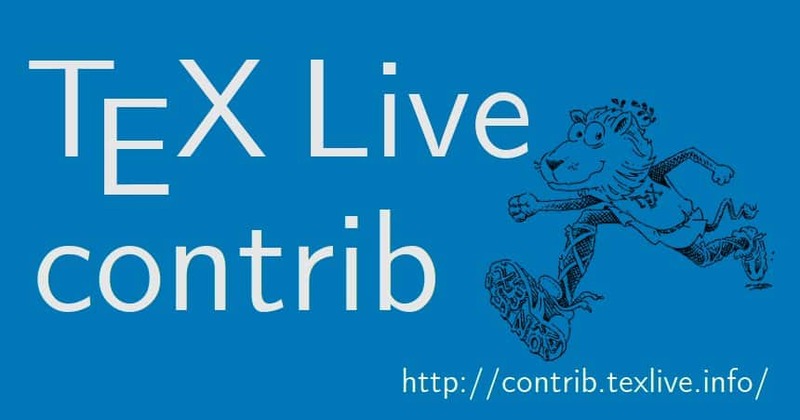 It is my pleasure to announce the renewal/rework/restart of the TeX Live contrib repository service. The repository is collecting packages that cannot enter TeX Live directly (mostly due to license reasons), but are free to distribute. The basic idea is to provide a repository mimicking Debian’s nonfree branch. because it is an intermediate release for testing. In short, anything related to TeX that can not be on TeX Live but can still legally be distributed over the Internet can hav e a placeon TLContrib. nosell fonts fonts and macros with nosell licenses, e.g., garamond, garamondx, etc. These fonts are mostly those that are also available via getnonfreefonts. The full list of packages can be seen here. The ultimate goal is to provide a companion to the core TeX Live (tlnet) distribution in much the same way as Debian‘s non-free tree is a companion to the normal distribution. The goal is not to replace TeX Live: packages that could go into TeX Live itself should stay (or be added) there. TLContrib is simply trying to fill in a gap in the current distribution system. In future there might be releases for certain years. After that tlmgr will tell you about failed authentication of this repository. Taco Hoekwater started in 2010, but it hasn’t seen much activity in recent years. Taco agreed to hand it over to myself, who is currently maintaining the repository. Big thanks to Taco for his long support and cooperation. In contrast to the original tlcontrib page, we don’t offer an automatic upload of packages or user registration. If you want to add packages here, see below. send me a link to the package explanation about free distributability/license. The packages are kept in a git repository and the tlmgr repo is built from after changes. The location is https://git.texlive.info/tlcontrib. This is great. I’m just wondering about Verdana font. It’s provided by this repo as well as “ttf-mscorefonts-installer”. Will they not conflict ? No, the package in this TeX Live repository does not provide the font, only the support files. The fonts have to be installed separately according to the instructions in shipped with the support files.